The Gallery Shop has a huge range of artisan wares on show. An initiative of the Barossa Regional Gallery, the shop aims to give visitors to the venue an opportunity not only to see the fabulous art on show but to also purchase something special by local artists to take home. Artists from all over the region including Adelaide Hills, Goolwa, Adelaide and the Barossa have items on show with a fantastic range of jewellery, glassware, textiles and ceramics available to purchase. It’s the perfect place to pick up a unique gift for any season. Supporting artists from throughout SA and further afield, the shop also aims to support local arts development with all profits from the venture going towards the development of programs and activities at the Gallery. “The Gallery has become a great hub for community activity and hopefully the shop can add to the experience for visitors to the region and support the local community at the same time” said The Barossa Councils Manager for Community and Culture, Kirsty Hage. 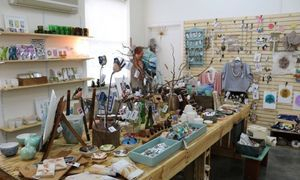 “The Gallery shop will be having a revamp over the coming months including a new look and stocking more local and South Australian artisan wares, stay tuned for more information on the exciting shop space” she added.